An indirect object is a person that someone or something does something to indirectly. In the simplest sentences, the indirect object directly follows a verb + preposition, so it’s very easy to see the effect that the verb has on that person. Il donne des fleurs à son amie. He’s giving his friend flowers. Je l’achète pour mes enfants. I’m buying it for my children. 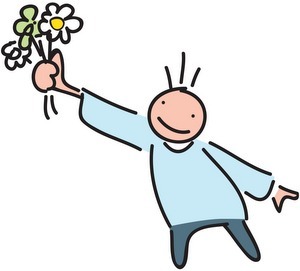 To whom is he giving flowers? To his friend. For whom am I buying it? For my children. *The person following "for" is only an indirect object when s/he is a recipient, as in "I bought it for you." When "for" means "on behalf of," as in "I think I speak for everyone when I say this," the noun after it is called an object of the preposition. In order to avoid repeating nouns in a series of sentences or when answering questions, both French and English replace indirect objects with indirect object pronouns. Je lis à mes enfants. Je lis à mes enfants chaque soir. I’m reading to my kids. I read to my kids every evening. Je lis à mes enfants. Je leur lis chaque soir. I’m reading to my kids. I read to them every evening. As you can see, the second version sounds much more natural, in both languages. + There’s no distinction between "to him" and "to her" in French; use lui for both. If you need to make a distinction, you can add à lui or à elle: Je lui ai donné le livre, à elle. + The first and second plural indirect object pronouns are identical to the first and second person direct object pronouns – learn more. In French, indirect object pronouns generally precede the verb, whereas in English they follow it – learn more. In addition, the French indirect object pronoun replaces both the preposition and the noun, but in English, some verbs have to keep the preposition, while other verbs have the option of keeping it. Il me parle. He’s talking to me. Je t’achète une chemise. I’m buying you a shirt, I’m buying a shirt for you. Elle nous donne son canapé. She’s giving us her couch, She’s giving her couch to us. 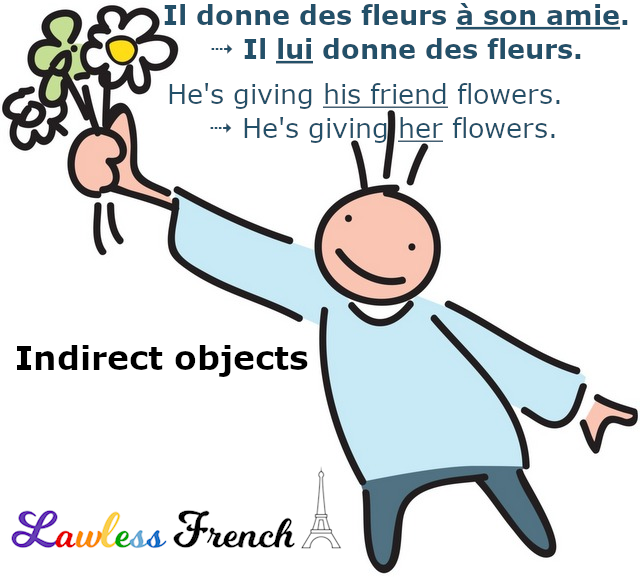 Some French indirect objects are equivalent to direct objects in English, and vice versa. Nous lui téléphonons une fois par semaine. We call him once a week. Lui is an indirect object because the French verb is téléphoner à. However, "him" is a direct object because "call" is not followed by a preposition. Où est Luc ? Je le cherche depuis midi. Where’s Luc? I’ve been looking for him since noon. Le is a direct object because the French verb is chercher with no preposition. But "him" is indirect because the English verb is "to look for."